Identify the parts of an atom. 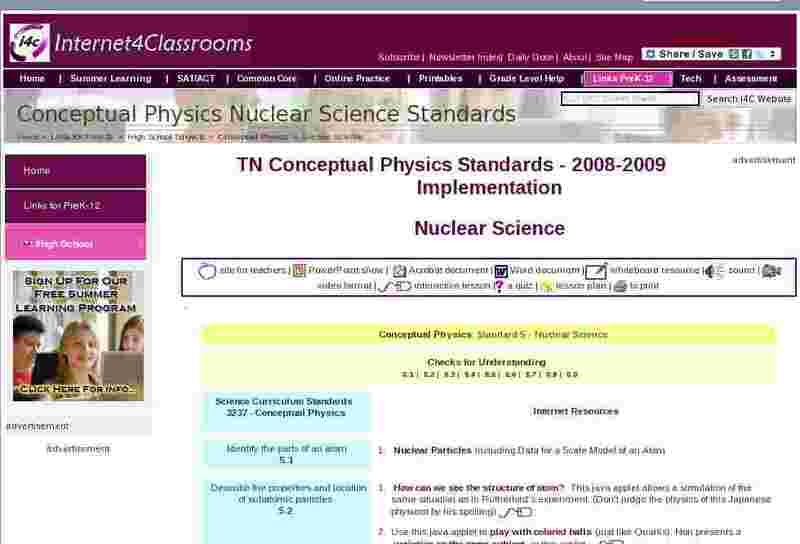 Describe the properties and location of subatomic particles. Use this java applet to play with colored balls (just like Quarks). Nori presents a variation on the same subject in this applet. Explain how particles behave like waves. Describe three forms of radioactivity in terms of changes in atomic number or mass number. Law of Radioactive Decay applet - As soon as the applet is started with the yellow button, the atomic nuclei will begin to "decay"
Investigate the concept of half-life. Write balanced equations for the three forms of radioactive decay. Explain carbon-14 or uranium dating methods. Distinguish between nuclear fission and nuclear fusion in terms of transmutation. Investigate the history of nuclear science.